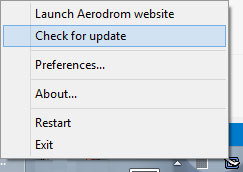 Aerodrom has been updated to version 1.2.4.0. Customers will get the latest version with the automatic update feature. Fixed slideshow playing: event notification similar to AppleTV. Fixed slideshow playing: slide duration now set by client. Fixed a WPF animation bug on photo transitions. Fixed connection problem with iOS 7. Updated Naudio to version 1.7.0.14. Updated libav to version 9.9.
iOS 7 functionality should be restored with this update. We only had limited time to test so please contact us if you have further problems with iOS 7. If you have problems getting the latest version please use our customers download page. (Update): We released version 1.2.4.0 short after 1.2.3.0 because of installer issues. Aerodrom Demo version updated to version 1.2.0.1. You can only use AirPlay for videos, photos and slideshows. The full version can also use AirPlay to stream audio. new video engine based on libav. iOS 6 and iTunes 11 compatibility. Fixed a problem with network adapters.